"As I was walking along, I met two large tortoises, each of which must have weighed at least 200 pounds: one was eating a piece of cactus and as I approached, it stared at me and slowly stalked away. The other gave a deep hiss and drew in its head. These huge reptiles, surrounded by the black lava, the leafless shrubs, and the large cacti, seemed to my fancy like some antediluvian animals." Charles Darwin was the astonished young naturalist who wrote these words, after his first encounter with the giant tortoises of the Galapagos. On island after island, he observed creatures that he had not seen anywhere else in his travels, yet some of them showed a marked similarity to certain South American animals. Upon returning from his voyage on the Beagle, Darwin spent over two decades studying his collections and reflecting on his observations. He ultimately formulated the theory which changed the way that naturalists view the world, and the future course of the biological sciences — evolution by natural selection. On this Nature Discoveries expedition we will discover, as Darwin did, the curious animals and plants that abound in the Galapagos. We'll visit at least 9 of the islands, cruising between sites during the night, and sometimes at midday. Each land excursion, up to several hours long, will give you ample time to observe, photograph, and study up close the fascinating plants and animals. 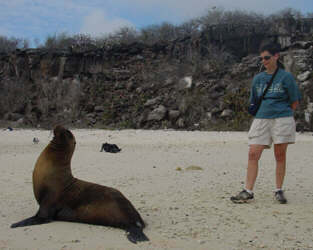 For wildlife lovers, the Galapagos is an earthly paradise. Isolated from predators for thousands of years, most of the animals show no fear of humans, and allow close approaches. We'll walk near nesting colonies of frigate birds and boobies (blue-footed, masked, and red-footed). You will have opportunities to snorkel amongst sea lions, and photograph the world's only penguin that lives on the equator. 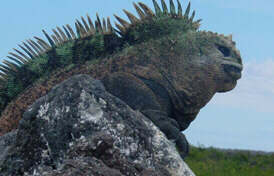 You'll get nose to nose with prehistoric-looking marine iguanas, colored differently on different islands. 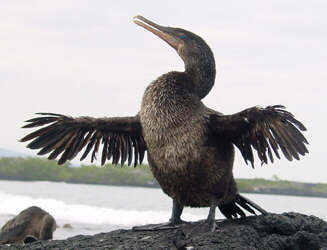 The Galapagos is rich with endemic species, organisms known nowhere else on earth. They will stimulate awe, respect, and reflection upon our place on this planet. Our daily schedule is sure to delight. After breakfast, we'll visit one of these islands for a walk amid its creatures. We'll return to the boat for lunch, with time for swimming, snorkeling, and relaxing. In the afternoon, we'll visit a new island or visitor site. After dinner, we gather for an informal review of the day's highlights, and receive a "briefing" to help prepare for the following day's activities. The itinerary has been carefully planned to bring you the best of this incredible archipelago. We'll visit several sites off the main tourist route, including the seldom-visited west coast of Isabela, where you will see flightless cormorants, penguins, and have a good chance to see truly wild (as opposed to being in a reserve) giant tortoises. Each of our groups the past four years has been rewarded with these sightings! 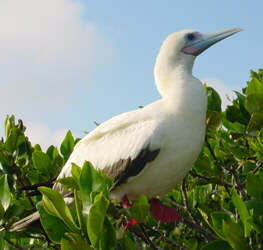 On Genovesa Island, you'll be just feet away from red-footed boobies and their downy young. On Española, you'll walk beside the nests of masked and blue-footed boobies, offering incredible opportunities for photos or video. On North Seymour the frigatebirds should be displaying their gaudy red inflated throat sacs. The flamingo lagoon on Floreana will delight. And on South Plaza, the bachelor sea lion colony is sure to captivate and amuse. These are just some of the many amazing encounters you'll have each day. Your guide and tour leader will help you see the significance of the sightings, whether it is animal behavior, plant diversity, or colorful fishes on the reefs. We have carefully planned this special chartered tour of the Galapagos: you will see more of its tremendous diversity than on any other tour of similar length. 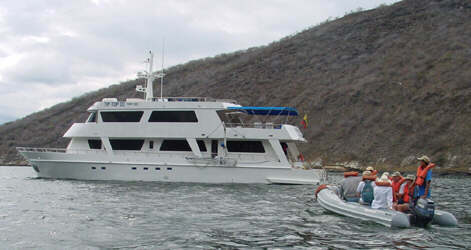 Our cruise is aboard the modern and spacious yacht, Tip Top III, owned by the renowned Wittmer family of the Galapagos. Rolf Wittmer, company founder and our scheduled captain, was the first European born on these islands. The Tip Top III is a new, 95-foot long motor yacht, air-conditioned, fully equipped, and comfortably accommodates 16 passengers and a crew of 8. It offers many of the amenities of a larger cruise ship, yet keeps the intimacy and flexibility that is an essential part of this small group experience. Prior to our week's sailing, we'll visit and tour Guayaquil, Ecuador's largest city, and our point of departure for the Galapagos. Your leader for the trip will be Steven Daniel of Nature Discoveries. Steven is a versatile naturalist who enjoys sharing the wonders of nature with our groups. Besides eight prior trips to the Galapagos, Steven has led groups to many natural destinations including Costa Rica, Hawaii, New Zealand, and Alaska. He holds a M.S. from Cornell University, and teaches at Monroe Community College. You'll be met on the boat by a trained Galapagos-born naturalist-guide, who will share his in-depth knowledge on each outing. Our leaders are key to your understanding and enjoyment of this trip. We are certain that you'll return home from this trip, as so many of our travelers have, with a deep understanding and increased appreciation for the special world of the Galapagos. "We want to thank you for leading that awe-inspiring trip to the Galapagos. Your professionalism and integrity permeated the atmosphere during the entire trip.....not to mention your and Martin's [Ecuadorian guide] attention to the minutest details to make the trip successful and memorable." "Your extensive knowledge of the Islands and their inhabitants.....sets the trip above the mundane meaning of a 'tour'". "My expectations for this trip were high. The actual trip went beyond this. Food, accommodations, staff, guides were excellent and the tour leader...gets an A+!" "The Tip Top was the right size.....we were well fed and well treated." "Where do I start? Seeing the animals and birds in "real life" was awesome! Living on a boat, surrounded by the sea, was a dream." "The format and pacing was perfect! I can't wait to do another trip with you." "The experience of being there was so overwhelming, I could not find appropriate words to explain my feelings and emotions.....How could I describe my joy when I made my first eye contact with a baby sea lion?" 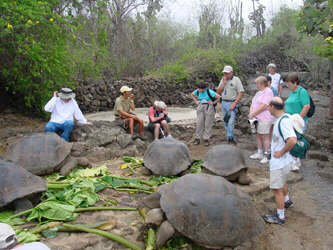 "I've told several friends the only way to see Galapagos is with Nature Discoveries!"